He has frequently described negative news coverage as “fake”. However, he has not provided any evidence for his claims. Hours before the briefing, Mr Trump had delivered a strong attack on what he called “fake news” in the media, targeting stories with unnamed sources. He said “fake news” was the “enemy of the people”. Mr Trump announced his non-attendance at the correspondents’ dinner via Twitter. Bloomberg News and the New Yorker magazine are among media outlets who have said they will not hold their usual after-parties this year. There have been some calls for journalists to boycott the event itself. Every sitting president since 1924 has attended the correspondents’ dinner at least once, according to the New York Times. They traditionally make a light-hearted speech at the annual event. Former US President Barack Obama attended eight times. 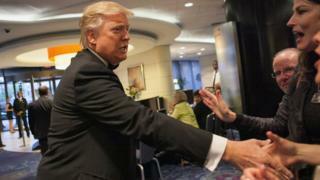 Mr Trump has been a regular at the dinner in the recent past. In 2011, Barack Obama joked that Mr Trump would turn the White House into a casino if he became president and made fun of rumours, then propagated by Mr Trump, that President Obama was not born in the US. The New York businessman was shown on camera sitting stony-faced through a barrage of jokes at his expense, including some from host Seth Meyers, although he said last year that he “loved that dinner”. Many believe that the 2011 event fuelled Mr Trump’s desire to enter politics and later run for office. In a statement the White House Correspondents’ Association said it took note of the president’s announcement and said the dinner would “continue to be a celebration of the First Amendment and the important role played by an independent news media in a healthy republic”.